Like I said, seitan has been preoccupying my mind. I wanted a breakfast sausage flavored seitan that would go great on a biscuit for a quick breakfast or scrambled up with some tofu and onion equally well. I have my heart set upon savoring pancakes with this spicy sage and apple seitan; maple syrup to be used liberally. 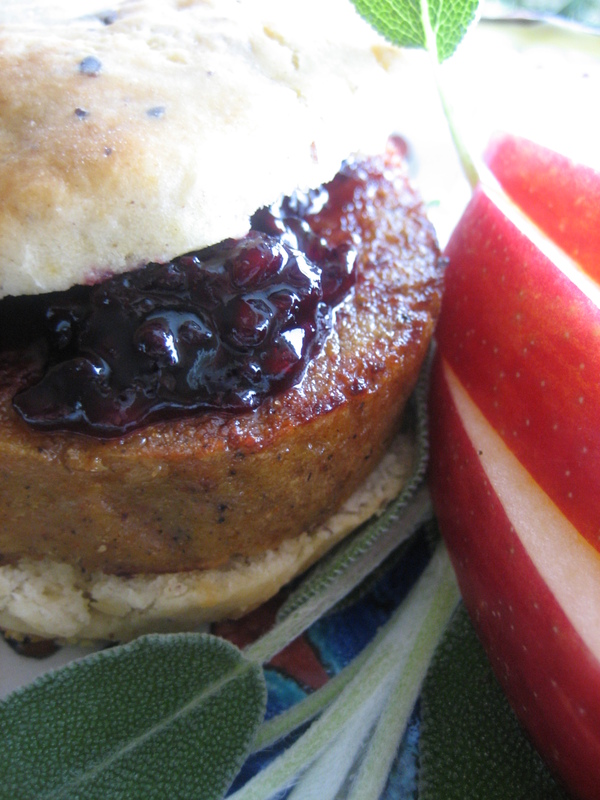 Vegan Apple and Sage Breakfast-style Seitan with Blackberry Preserves. Mix dry ingredients together with a whisk until evenly distributed. In a separate bowl mix together the wet ingredients. Pour the wet into the dry and combine just until there are no longer any dry patches in the dough. Divide the dough into two and roll into separate logs using aluminum foil. Twist the ends to secure the logs. Bake for 90 minutes. Allow to cool, slice and heat in a skillet to crisp up the sides. This seitan can be very moist and chewy. The thicker you make your roll, the chewier the texture shall be. Also, slicing it thinner and browning it in a skillet before serving will diminish this texture if you would prefer a dryer seitan. I like to slice mine on the thinner side [1/3 inch or so] and brown the edges while still leaving a slight soft center. You’ll get the knack for it once you make it and experiment on slice widths and browning times for yourself. I was at Metropolitan Mkt yesterday and got COCONUT COFFEE CREAMER… woo, I thought of you and was very excited!! I don’t think I’d use truffle oil for that unless it’s mild, it would be really earthy, no? I don’t think it’s really a key ingredient necessarily. I’d use something more along the lines of hazelnut oil or canola as a substitute. I’m so jazzed they started stocking the creamer! It’s really the best and is a godsend in cooking. I made a creamed sherry sauce the other night using it and it turned out really well.